Small Yet Mighty The Marshall MS-2 is a 1 watt, miniature combo amplifier stack with the classic Marshall styling that has adorned the backl.. 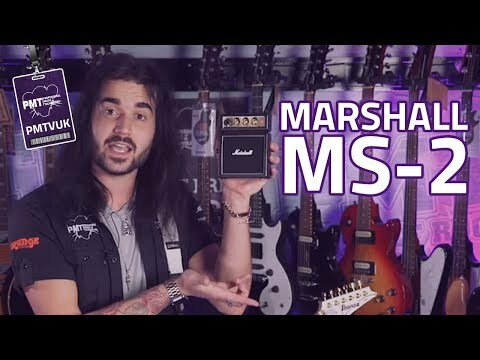 The Marshall MS-2 is a 1 watt, miniature combo amplifier stack with the classic Marshall styling that has adorned the backline of Rock & Roll stages for decades. Conveniently sized to sit on your desktop or kitchentop at home, the MS-2 in Black is an ideal gift for the guitarist in your life and 9v battery powered, so you can always keep it with you when inspiration strikes. A 6.3mm Jack headphone output also doubles up as a preamp out, so you can even utilise it for studio recordings and offers switchable Clean and Overdrive modes with dedicated tone control.